Home maintenance is an issue that all homeowners face, and is an issue that shouldn't be ignored. Frequent maintenance and repairs are needed throughout the year. Sears Handyman Services will allow you to sleep soundly at night knowing that the repairs were professionally taken care of by qualified handyman technicians. If you have pressing renovations, home repairs, or home improvement projects that are looking like too much for you to handle, Sears Handyman Services can help. Our technicians are specialized in a variety of areas from plumbing to drywall installation. Sears Handyman technicians can assist you in minor to intermediate repair needs. Give us a call at (844) 224-2639. Do you have a ceiling fan that no longer works or are you having problems installing your new LED lights? Sears Handyman Services is the place to call. We provide experienced electrical services for a variety of electrical issues that don't require a professional electrician. Call today and inquire about the electrical repairs and installation services we offer. Drywall is the most common type of wall in most homes. Between kids, pets, and accidents, your walls have to withstand a lot. For those times that the drywall cracks and breaks, Sears Handyman Services is the professional team to call. We are experienced with everything from minor drywall repairs to installation of brand new drywall. Give us a call today to discuss your requirements; our technicians know how to tape, patch, and repair drywall the right way. Sears Handyman Services is experienced in repairing decks, whether it is due to wood rot or normal wear and tear. We can also build the deck of your dreams. Our technicians are also experienced in everything from treating your deck to prevent water damage to staining the wood to capture the best look of the wood. Give us a call for all your deck maintenance needs so you can get back to enjoying and relaxing outside. Fences are the perfect way to secure your yard and can complement the overall look of your property. Sears Handyman Services is equipped to provide you with picket fences, privacy fences and chain-linked fences. Whichever fence you need, and for whatever reason, Sears Handyman Services can help. Many people avoid painting, mainly because it is a very time-consuming process. 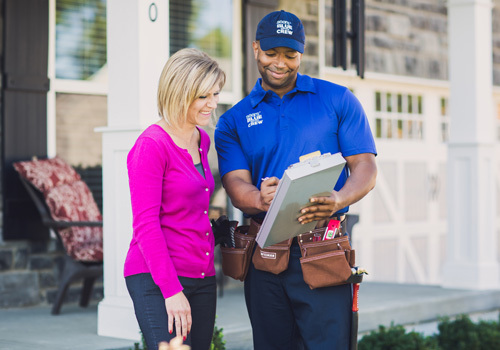 Sears Handyman Services gives you the peace of mind knowing your home, interior or exterior is painted professionally and in the shortest amount of time. Hard-to-reach areas are no match for our experienced technicians and we will leave your home looking great.